Many gathered from all parts of the tri-County excited to have the opportunity to meet Florida’s next best chance at having a leader that understands the dire needs of its residents. District 9’s Commissioner Dale Holness and his staff hosted a breakfast Friday to welcome Florida’s next Governor. Andrew Gillum, the mayor of Tallahassee and Democratic Party nominee for governor of Florida 2018, walked in swiftly to greet the growing crowd that sacrificed a few hours of their workday to hear what he had to say. 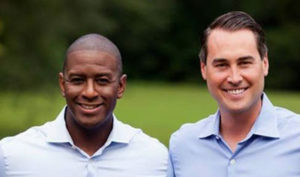 Smiling bright and energized, Gillum thanked everyone for their attendance, which included a vast number of dignitaries, many of whom engaged in side conversations that clearly demonstrated their rapidly growing belief that change is finally on the way. Broward County, housing nearly 2 million residents of possibly the most diverse population in the United States, had a few of its them ready and waiting to ask the tough questions. 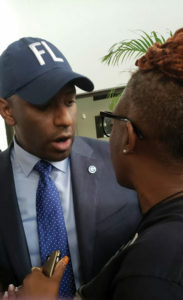 Can we trust you was one of the questioned I posed to Mr. Gillum minutes after he completed his brief but powerful speech. As a Registered Nurse, I know all too well the frustrations of hard working people feeling the pain of underrepresentation by the very leaders that make us promises of better but end up leaving us worse off. Mr. Gillum stopped to listen to my concerns, responding to my questions directly while phones flashed and hands attempted to pull him aside for a chance photograph. It is finally our time, we can make things better and we need to get out and vote were common statements in this setting, and I’m sure many of us were thinking we would get more of the same, but something was different. There was a light, a glow of aspiration. Representative Al Hastings felt it; he could barely speak from smiling so hard. Today passion was reawakened in the state of Florida, a task that is nearly impossible among the many who still struggle to make ends meet even while working more than one job, a topic the future Governor made clear was a major concern of his. Will this be the year? Will this leader be unaffected by the luring caress of power? Will this leader stay true to his promise to represent ALL the people of Florida? I believe he will. Let us see if he proves me right. Special thanks to the leaders or our community: Representative Al Hastings, Dr. Rosalind Osgood of the Broward School Board, Sheriff Scott Israel, Commissioner Dale Holness and the all the other officials present. Your commitment to making our county one to be admired is noticed and held to heart. To the rest of the guests, all of whom made this event a success by simply being there, you have made it clear that you understand that the future of our state needs all hand on deck. Let’s get to work!